Gulp is flexible enough to work with any folder structure. You'll just have to understand the inner workings before tweaking it for your project. source is the folder where we will do our work. assets/stylesheets/style.css will be created by gulp when we process and combine our SASS files in source/scss. Before we get right into the code I think it's very important to mention that gulp only has 4 top level functions. gulp.task defines your tasks. Its arguments are name, deps and fn. //do stuff after 'task-name' is done. 'task-name' refers to the name of the task, which would be used whenever you want to run a task in Gulp. You can also run the same task in the command line by writing gulp task-name. gulp.src points to the files we want to use. It's parameters are globs and an optional options object. It uses .pipe for chaining it's output into other plugins. gulp.dest points to the output folder we want to write files to. gulp.watch method that checks to see if a file was saved. gulp.watch like gulp.task has two main forms. Both of which return an EventEmitter that emits change events. The first of which takes a glob, an optional options object, and an array of tasks as it's parameters. Once gulp is installed we have to give it some instruction so it knows what tasks for perform for us. But, first, we need to figure out exactly what tasks we need to run in our project. 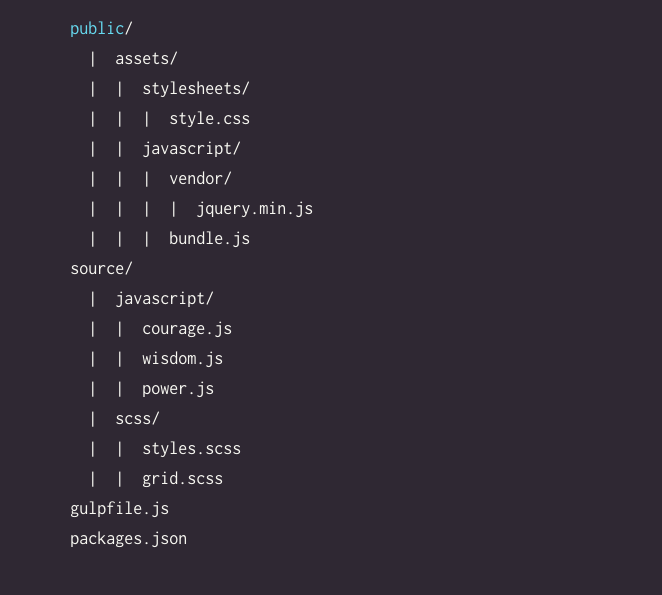 This will install all of the plugins we will need and add them to our devDependencies in our package.json file like we did when we installed gulp. Now we’ll add the lint task to our gulpfile. So lets step through what we’ve done. will run the watch task. Now we’ll add the compile SASS task to our gulpfile. Sass serves as a way to extend CSS giving support for variables, nested rules, mixins, inline imports, and more. For sass compilation we’ll use gulp-sass. We’ve only scratched the surface of gulp. Gulp can be as complex or as simple as you need it to be, and because it’s just code you can do just about anything you want as a task.